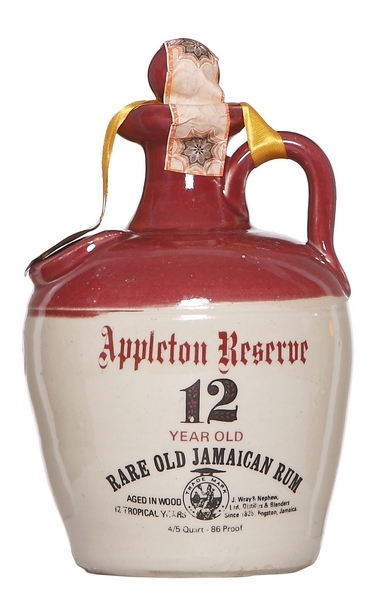 A “Rare Old Jamaican Rum” the ceramic jug says, and I believe it. In all my travels around the world, I’ve never seen this kind of thing for sale (and buying beer in a glass jar at a kiosk in the Russian Far East don’t count). We’re living through an enormous upswell of interest in rums, with new indies and new bottlers popping up every time we turn around…but stuff like this shows us that even back in the day, there was some amazingly well-presented juice floating around. Here, cool factor is off the chart. As for the rum? Very nice indeed. Aged in the tropics (of course – where else would Appleton be ageing its stock?) and better than both the other 12 year old we looked a the other day, and the modern one. Nose – Initial attack is as dusty and dry as a mortician’s voice (and he’s wearing well polished old leather shoes, that’s there too). Oily, vaguely like cigarette tar (not my favourite smell). Coffee and chocolate, citrus rind, and then a nice procession of tart ripe fruits…mangoes and red guavas. Some saltiness and dates and grapes, not much funk action as far as I could tell. Palate – Some bitterness of unsweetened black choclate starts things off, hot salt caramel over a coffee cake (same kind of dessert taste I got on the last 12 year old).Wood shavings, some more leather, more cigarette smoke, and then the fruits timidly emerge – citrus mostly, also bananas (barely), and a dash of breakfast spices, nothing overbearing. Finish – Weak point of the experience, after the above-average smell and taste. Dry, sawdust (the mortician is back, shoes squeaking), leather, light chocolate, caramel, and the barest hint of the fruits retreating. Not impressed here, sorry. Thoughts – It’s better than many other, more recent Appletons of various names (like “Extra”, “Reserve”, “Legacy”, “Private stock” and so on) and those of younger ages, beats out the other twelves that have been tried…but not by leaps and bounds. It’s not a furious game-changer. It sort of edges past them as if ashamed to be seen at all. A good rum, and I liked it, but it does leave me puzzled too – because I thought it could have been better and didn’t understand why it wasn’t. Some interesting and divergent perspectives on this one, from other members of the Rumaniacs. You can check out their opinions in the usual spot.